Tim Goeglein was fired for plagiarism but found forgiveness from the president he wronged. Washington (CNN)– Tim Goeglein never expected to see the president again, let alone get called into the Oval Office, because he committed the ultimate Washington sin - he betrayed the boss. "The leader of the free world has lots of people to see, he has lots of things to do," Goeglein said, sitting in his office at Focus on the Family, where he is now vice president of external relations. "The thing that leaders of the free world don't often do, probably, is ask aides who have just embarrassed them and brought shame upon the White House, they don't typically invite them to the Oval Office," he said. But that Goeglein said is exactly what then-President George W. Bush did. February 29, 2008, Goeglein said, was the worst day of his life. He was made. His secret exposed. 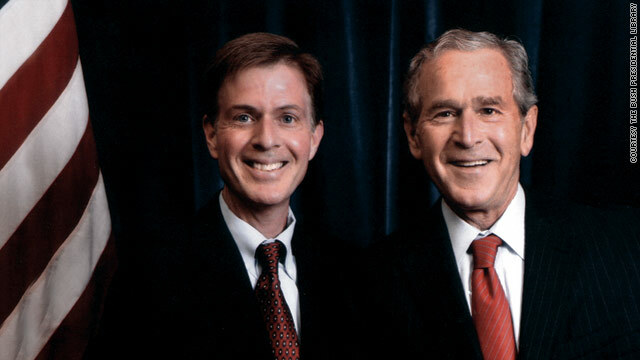 Goeglein was a staffer in the Bush administration, an aide to Karl Rove, who dealt with faith-based groups. That day in 2008, Goeglein was caught plagiarizing a column he wrote for his hometown paper in Fort Wayne, Indiana. Goeglein copied large sections of an essay for The News-Sentinel nearly verbatim from author Jeffery Hart, whose writings appeared in the Dartmouth Review in 1998. Goeglein had written a weekly column for the paper and after the plagiarism was first discovered, editor Kerry Hubartt said they found instances of plagiarism in two other columns from Goeglein. Once he was found out, Goeglein knew his actions would reflect on his boss, the president. He resigned and thought he would be banished from the Beltway forever, a fate he says he fully deserved. "Today, Tim accepted responsibility for the columns published under his name in his local newspaper, and has apologized for not upholding the standards expected by the President." "The President was disappointed to learn of the matter, and he was saddened for Tim and his family. He has long appreciated Tim's service, and he knows him to be a good person who is committed to his country," the statement read. "It is true. I am entirely at fault. It was wrong of me. There are no excuses," Goeglein wrote at the time in an e-mail apologizing to The News-Sentinel. "I was not the senior-most person and I was not a confidant to the president," he says now, but his fall from grace was spectacular nonetheless. But what was unknown at the time was what happened behind closed doors between the aide and the president. In a new book, "Man in the Middle: An Inside Account of Faith and Politics in the George W. Bush Era," Goeglein paints a picture of a sympathetic president who forgave him, an act that allowed him to have that rarest of political moments, a second act in Washington. He was exposed on a Friday and promptly resigned, confessing what he had done. It was a bad place for any employee to be - let alone the liaison to the Christian community. Monday, he came back to clean out his desk. The White House chief of staff stopped by and told him, "The boss wants to see you." A few days later, Goeglein found himself in front of the president. Goeglein writes he tried to apologize but was cut off. "Tim, I want you to know I forgive you," Goeglein recounts the president told him. He tried again to apologize and again was cut off by President Bush. "I have known mercy and grace in my own life, and I am offering it to you now. You are forgiven." The president then asked him to join him in front of the fireplace in a chair normally used by the vice president or heads of state for photo opportunities. The two chatted about the past eight years working together, and they prayed, Goeglein writes. Goeglein said the president invited him back to the White House numerous times after that meeting, including with his family the week after the act of forgiveness, validating Goeglein in front of his wife and children. He also attended the president's farewell at Andrews Air Force Base in 2009. Had he kept his nose clean, Tim Goeglein would have likely gone unnoticed by history. But is it precisely because of his sin that his words are given weight. He says he saw a side of Bush that he says bears recording, one of compassion rooted in faith. That intersection of faith and public life stirred him to reopen a personal and public wound. He wanted to show, "How does the man live his faith?" "I experienced as a result of George W. Bush's grace and mercy, at a very personal level, a very important chapter of forgiveness in my own life and the ability to start again," he said. Goeglein says Bush's legacy is being looked at anew, a fact which played into his decision to write the book. When Bush left office he was deeply unpopular. The country was mired in a down economy and two wars. "I wanted to show, not just how his faith impacted the domestic and foreign and security policies, which I do, but I also wanted to show in real human terms how his faith impacted his relationships," Goeglein said. From his desk in the second floor of a bright town house at Focus on the Family in Washington, Goeglein can look across the street to the Supreme Court. His walls are covered with artifacts from a career inside the beltway: photos of him with Bush, a Richard Nixon autograph, an Inauguration ticket stub, reproductions of the founding documents. In his new capacity he has worked with President Barack Obama on his fatherhood initiative, a program that has crossed party lines. As far as Goeglein is concerned, none of this would be possible were it not for a single act of forgiveness. Next entry »Famed Hasidic reggae star sheds the Hasid part? Bu sistemde ukash kartı sahibi kredi kartı ile üye iş yerlerinden mal ve hizmet alırken nakit ödememekte, harcama belgesini imzalayarak alışveriş yapmakta; üye iş yeri de kredi kartı sahibine sattığı mal ve hizmet bedellerini, kredi kartı sahibinin imzaladığı harcama belgesi tutarlarını ukash kart kuruluşuna ibraz ederek tahsil etmektedir. Ukash kart al çıkaran kuruluş ise, ukash kartı hamiline hesap bildirim cetveli göndererek harcama tutarının ödenmesini istemektedir. Burada üye işyeri kredi kartı sahibinin mal ve hizmet sunup anında nakit almamak yoluyla fiilen bir ukash satın almıştıtr. Ayrıca harcama belgesinin ukash kart kuruluşuna ulaşması ile hesap kesim tarihi arasında geçen süre için ukash kart çıkaran kuruluşa, ukash kartı sahibine bir güvenli ukash sağlamış olmaktadır. Howdy, this is a nice post. You have my vote for this and also I'll bookmark your blog right now. Nim Nim, Num Num, Get a Job! Sausages and Ice Cream are delicious! Oh yeah ... and you are all Epic Losers! If you like Bush, you are a loser. If you hate Bush, you are also a loser. Don't care about Bush? Yep, you guessed it! Loser. Finally, and most importantly, if you're not sure who Bush is, or have forgotten, you are a loser too. Pretty much, if you are reading these comments, getting upset by these comments, getting excited about these comments, or leaving comments of your own, then you are a loser. Except for mine - this comment is awesome - so I am not a loser. But you are. And if you respond, in any way, then you too are a loser. And then someone else will respond and call you a loser. I will not respond, because I am not a loser (because this comment is awesome), and will not return here. So, please, prove yourself the world's biggest loser by being the first to "respond" to my "comments." Not that anyone cares, because if you're making comments on here, you're pretty much a loser. I am fairly confident that George W would *NOT* forgive you for being such a loser. Neither would Clinton, God, or Moses. It would seem that misrepresentation is a job requirement at 'F Us and the Family'. Why note hire a plagiarist? Wait a second: George W. Bush had "standards"? Now, THAT'S news. Can you imagine the conversation "Tim, copying someone else's work is a very serious offense. When I went to Yale and Harvard, I never copied someone else's work. I had someone else copy it for me. That way, if you get caught, you can claim someone did the old switcheroo on you. Heck, I was there for six years and still had an inch of ink left in my bic pen. Now let me ask another question. Do you REALLY know how to work them Internets? You must be one of them there geniuses." Human opinions are like snow flakes, no two are the same. Why plagerize someone even remotely known or famous?? There are plent of unknown people with talent to plaigerize from and never risk being caught. I would venture a bet, very few people got through college without taking a little "help" in the writing area. Now we have "turn it in" to check things for teachers. I know several people caught that way. What really amazes me is folks really think they won't get caught, that no one will "notice". What a Bloody Mary it was...! The News-Sentinel found 27 instances of plagerism, not 2. WILL HE STILL WRITE A BOOK AND MAKE MONEY? The editor of the News-Sentinel is Kerry, not Jerry. Pfft. What's a little plagiarism? That guy should run for Biden's old Senate seat. In the belief blog fantasy section rather than news. That's the right place for once.